To propagate Sanskrit throughout the nation Ekalavya Campus of Rashtriya Sanskrit Sansthan (Deemed University) is situated in Northeast, Agartala the capital of Tripura. With the blessings of the Supreme Goddess of Tripura Tripurasundari the Ekalavya started its journey in 2070 Bikram Sangbat in the month of Jeistha on the 11th day of fortnight of lunar month i.e. on 4th June, 2013 at Swami Vivekananda Mahavidyalaya, Agartala, Tripura. To promote Sanskrit in the Northeastern region of India this campus is working with bated breath. At present the campus is running its course at Old IASE building at Radhanagar near Bouddha Mandir given by the State Government of Tripura along with Administrative building, Academic block, Library, Girls hostel, Gymnasium, Playground, Psychology Lab and Language Lab. 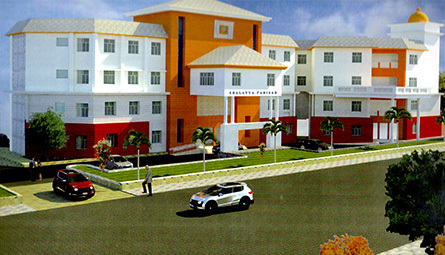 The main building of the Campus is under construction within an area measured 3.25 acre at Lembucherra, Tripura. To study Shastras properly at Prak-shastri, Shastri and Acharya level the curriculum of this campus is comprised with departments like Jyotish, Vyakarana, Sahitya, Dharmashastra, Vedanta and Bouddhadarshan. Hundreds of students pursue knowledge in all these disciplines along with other subjects like Hindi, English, Bengali, Political Science and Computer Science. This campus is a perfect confluence of traditional and modern subjects. Not only this, it offers -professional courses like Shiksha Shastri (B.Ed) and Vidyavaridhi (Ph.D). This campus has started offering learning through distance mode from 2016-17 under Distance Education Centre of Rashtriya Sanskrit Sansthan (Deemed University), New Delhi. This campus organizes various kinds of national level events like Inter-Sanskrit University Youth Festival, All India Shastrath Teaching Workshop, 9th Inter-campus Youth Festival, All India Elocution Contest etc. as per the order of Rashtriya Sanskrit Sansthan (Deemed University). In this journey of progress Ekalavya campus devotes itself solely to the service of Sanskrit.